This sturdy 16 qt. aluminum colander, equipped with a base and two handles, is perfect for liquid straining and food rinsing. This colander's round base allows you to securely place it in your sink to avoid splashing hot liquids. The added height of the base also improves sanitation when placed on work tables and counters. In addition, the riveted handles make it easy to transport around the kitchen. The 16 qt. Aluminum Colander with Base and Handles works very nice for big batched of pasta. Its nice to have a base so it doesn't wobble and spill when dumping a pot of pasta. The handles are sturdy and it has lasted us for many years. This is so great for a busy kitchen. I use it when draining pounds and pounds of sausage and I don't know what I ever did without it. Great price and wonderfully large colander that seems durable and built to last. Best part about this colander is how it fits perfectly in our 3 compartment sink with the handles holding it up. I use it to drain the washed the tomatoes out of the garden or out of the blancher, and receintly used it to drain the thin Spaghetti noodles when I put on a dinner for the whole church. Love your products. It is an easy product to clean if you have a basin sink & it can hold enough Spaghetti along with the 12 qt. Strainer to feed a normal church. We have a pizza restaurant. Draining and washing wings, vegetables and other things are always happening. This strainer is of high quality and so durable. My husband is highly impressed and has told me to order another one! The size is great and the depth is awesome! Simply a great product at cheep price! Satisfied customer here! This thing is HUGE and we use it daily for all kinds of tasks. It's heavy, so remember: lift with the legs! Easy to clean tho. Great product. We used to strain chicken wings and other meats. This strainer is heavy duty and very sturdy. Definitely recommend and will purchase again. The aluminum colander is great for making pastas in a large pot. It keeps the pasta from sticking to the bottom of the pot and burning it. Very strong colander. We use for large amounts of pasta and the handles are very sturdy. We never worry about spilling our pasta. Easy to clean! Great colander! It is sturdy and durable. Makes food rinsing so easy. Love the handles for easy pick up. I would recommend this product to everyone! This is a great quality colander it is made from great material and is built to last we have many uses for this product and I would recommend this for all types of restaurants . We use this 16 qt aluminum colandar with base and handles to drain all cooked noodles for our mac and cheese. A great size colander without being too large for our dish and drying racks. This is a solid colander. Having a base and handles helps a lot. The base ensures no food touches the bottom of the sink. The handles make it easy to transport hot foods. I have used these for years and they are great but I will say one thing: as they get older the rivets may come loose. Replace the unit they are inexpensive! Don't lose a rivet in your food! Great quality and awesome price on this compared to prices from restaurant supply retail stores. This is perfect for every day use and with stands abuse. Easy to clean and maintain. Works for large jobs (we use it for big batches of pasta and washing lettuce) and overall a standard kitchen tool. Had my boss purchase one of these for the learning kitchen I work in. So useful, so amazing for draining the pounds and pounds of pasta we make with the kids. A true game-changer. Sturdy, lightweight, perfect at what it does. Large and very heavy duty. Does not feel like i will bend under pressure which is a good thing. The raised base is good in that it does not sit directly on the sink or counter surface. Two handles make for easy movement even with hot items inside. This is great and easy to clean. It holds a lot of pasta or blanched vegetables. I find the water drains faster than others and does not hold much residual at the bottom. What a great strainer! This thing is a beast! It will hold a complete stock pot of product and is very heavy duty. I highly recommend this product. Great product! Easy to use and we love that it has handles to make it east for transporting to the sink. Base makes it easy for standing on its on. What a massive, well built colander for an amazing price. I couldn't believe the price point on this and it fits in my veggie prep sink PERFECTLY. Love it! 16 qt. aluminum colander with base and handles is a great product. I have no complaints at all and it does the job. Great quality. This colander is a beast. 16qt is enough to prep a days full of zucchini. Its amazing, helps to easily prep vegetables. get it, get it today. Colander is very large and great for draining most items. Wish the holes were a bit smaller for items such as orzo pasta, but effective for 99% of uses. This is a colossal colander! If you have a large enough sink, it's a great kitchen tool! Perfect for rinsing a bunch of apples at once! This is a very nice, large Colander. The only problem I had was that it arrived scratched up because when the order was packed they packed a pot inside of the colander and during shipping the pot really scratched the colander. I contacted Customer Service and sent them pictures of the damage and they promptly fixed the issue. I highly recommend Web Restaurant. They have great customer service. I highly recommend this colander! You don't an extra person to hold the strainer, because this one has a foot and can be placed in the sink. It's nice quality and easy to clean. This product is great. We use it to strain large amounts of ground beef when making taco meat. It is stable and easy to carry and use..
this came well packed, after a long period of using it there was no rust stains left on it from air drying like most pots. Great product for the price. We use these all the time. Will be purchasing more of these in the near future. Very very much satisfied. This thing is great. It is huge. We use it for steaming greens in our steamer, as well as for washing and prepping vegetables. Love it. We received this in perfect condition, (no dents, scratches), and it provides us with the volume to drain large quantities of diced tomatoes for our salsas. Excellent value. Big and durable enough for a huge pot of pasta without tipping over in the sink. The weight is perfect, and the handles make it super easy to carry around the kitchen. It's also easy to wash, just make sure to run the sponge around the holes a couple of times before rinsing. This is a very large colander so be careful when purchasing it. It easily holds 30 servings of pasta. You may want to know the measurement of your sink and the width of the colander before you buy this. The base is great but it is not useful if the colander is too wide to sit inside of the sink. For me I have too narrow a sink and so it just rests on the lip of the sink. This colander is great for my huge kitchen. I can drain 5 pounds of pasta at a time. The finish is nice, and doesn't break down with the use of the sanitizer. Very large but it does fit in our 3 bay sink. Great for straining veggies and beans. Easy to clean, very durable, holds a lot. Very large, very sturdy colander. Make sure to have enough room under the table - this colander will not disappoint you. First one arrived dented on the bottom, however it was replaced with no hassle. Great product, will last a long time. Lightweight - arrived with a dent but nothing that affects performance. Very nice for draining blanched veggies or pasta after cooking, the base is helpful for straining. Honestly did not realize how BIG this colander is - this will do the job for any big straining needed. We will use for washing large produce batches before juicing as well. Great for holding multiple pounds of berries, peppers, etc. This colander with base is a great value. The colander is sturdy and holds up to a lot of use. The colander is a great value for any kitchen. The 16 QT. 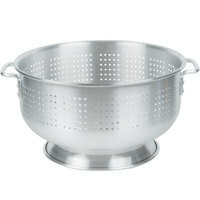 Aluminum Colander with Base is great.I love draining my pasta's withe this colander with it's sturdy base and handles. the price is great. Perfect for big events with large portions. We can shock this in a big bus tub and do an entire meals vegetable in one shot. Straining pasta, or blanched vegetables is great when using this product. The big size of the vessel is perfect for any task in the kitchen. Have been needing a big colander for awhile for catering and banquets. This one works great, and is really cheap! the aluminum is little strange to the touch, but I have sensitive fingers from an injury. The price is worth a very small occasional discomfort. we use this product to drain pasta we cooked. it works really well. it is very good quality and strong. we use it very often. This is a hugh collander. It can be used for a home kitchen or commercial purpose.No matter the purpose for which you need this, it will serve its course, it helps to save time.If you do large cooking, you will love this colander. Nice size colander. Fits into three bay sink for easy draining of pasta. Dishwasher safe and easy to stack. We have two of them for all of our pasta. This colander is huge. I am very pleased with the quality and the construction.This colander is built for heavy use and will be around for a long time.